Jeanne Howell was born and raised in southwest Houston. 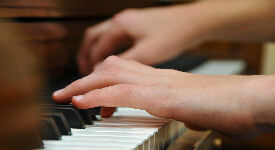 She began her study of piano at the age of five. After having her children, she went back to school to study music history, theory, performance and pedagogy. She and her husband, Bruce, met in chemistry class at Brigham Young University and were married in 1975. Bruce practiced dentistry in Missouri City, Texas for over 23 years and was also a Clinical Assistant Professor at the University of Texas Dental School. He was the editor of the Journal of the Greater Houston Dental Society and also a contributing writer for the JADA. He is a computer whiz developing a dental software program for use in dental offices. Bruce now practices dentistry and orthodontics in Longmont. He and Jeanne enjoy playing racquetball, playing Qwirkle, the snowy winters, hockey, BYU and Denver Broncos football, cooking, funny sitcoms, serving in their church and enjoy just being here in Colorado. They have two grown children. Michael, 37, graduated with honors from BYU Law School in April 2007. He is an attorney with an Intellectual Property law firm in Salt Lake City. He is a mountain biking enthusiast, skier, and loves to talk politics. Mike and Janelle were married in June of 2008. She graduated with a master degree in Public Health and is working for a company conducting advanced genetic testing and research. She loves to read. Leslie, 34, graduated from BYU with a degree in history and cultural anthropology. She is an owner and manager of Airtime Training Center in Springville, Utah. She loves to ski, fish, play softball, and to do scrap booking and quilting. She is also a Gymnastics judge for meets and competitions. Leslie and Eric were married in July of 2008. Eric graduated with a BS in nursing and is working at LDS Hospital in Salt Lake City with cancer patients and with bone marrow recipients. He is a body builder enthusiast, trainer and competitor, a fisherman and also a skier/snowboarder. Charlotte was born in August of 2013 and is a precious little girl. Grandma calls her MoonPie. 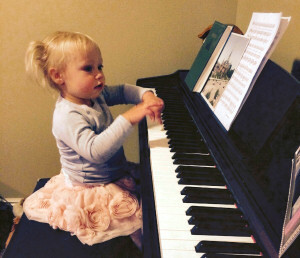 She has already shown an affinity for gymnastics, singing, dancing and of course, piano. Jeanne is an avid bird watcher and loves hiking, fishing, quilting, gardening, cooking and being with her family which includes the cat. She also collects PEZ candy dispensers; currently the collection has over 900 different dispensers. In Texas, she was a permitted wildlife rehabilitator, specializing in baby squirrels, but also cared for cottontails, song birds, ducks and an occasional opossum. She loves classical music and classic rock'n'roll. Her favorite composers to listen to are Ravel, Debussy and Rachmaninov, and her favorite to study are Bach, Mozart and Chopin. She really enjoys music history, composer biographies, musical instruments from other cultures and in the spring of 2008, began composing teaching pieces and finished writing her first Sonatina. She has been the organist at church for eons, she served as President of the Boulder Federated Music Club from 2014-2016 and was on the State Board for the Colorado Federated Music Club from 2014-2016 as well.